Locking up the brakes is one of the biggest risks involved in situations which require panic braking. Given our road conditions, you never know what obstacle may come in front of you demanding you to brake at a moment’s notice. Maybe this is why the government has finally made it mandatory for all cars and 2-wheelers with more than a 125 cc engine capacity to offer ABS as a part of standard equipment. Preparing for this new regulation well in advance, Piaggio and Aprilia will be offering ABS on their 150 cc scooters. 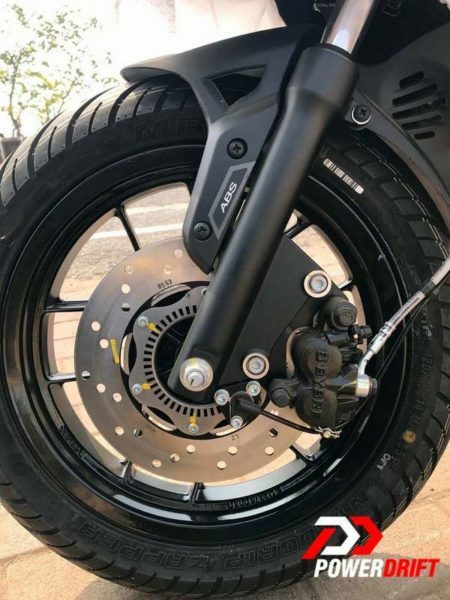 Here are some spy shots showcasing the ABS ring present on the front disc of these gearless scooters. Both these scooters get a single channel ABS system which is present on the front disc brake. Denoting the presence of ABS on both bikes, there are small ABS stickers present on the front end of the scooters. The Vespa 150 uses a 150 cc motor which pumps out 11.4 hp and 11.5 Nm whereas the Aprilia SR 150 uses a 154 cc engine which is good for 10.06 PS and 10.9 Nm of peak torque. 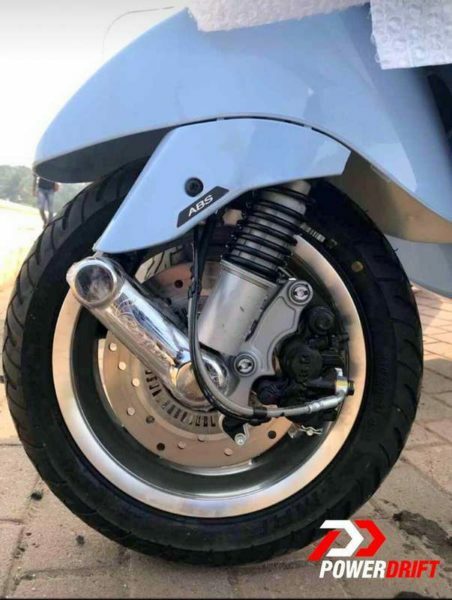 These scooters get a 220 mm disc brake in the front and 140mm drum brake at the rear. Currently, the prices of the Vespa 150 range from INR 92,000 to INR 1,03,000 and that of the SR 150 range from INR 72,000 to 82,000. (All prices are ex-showroom, Delhi). Expect a premium of about INR 5,000 with the addition of ABS.